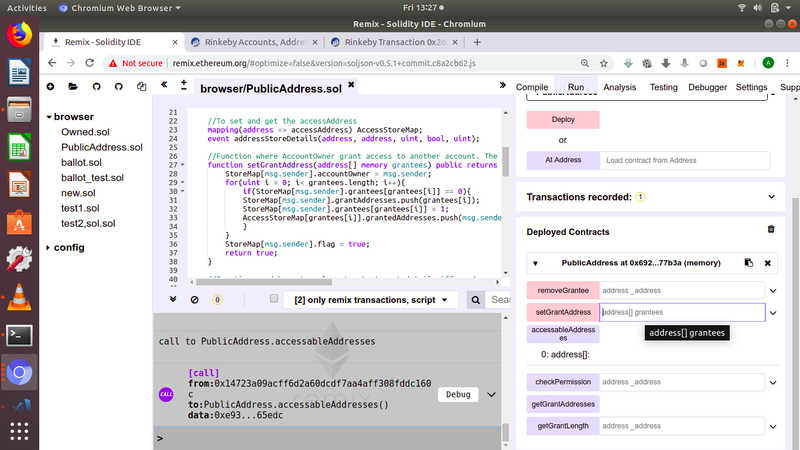 I need help for deploy below smart contract on remix IDE. I have facing a problem as I need to input to 'setgrantaddress' as address, How to input data in it? There is two file name owned.sol and PublicAddress.sol. The smart contract details below. Ethereum smart contract that can record a user's public address as having granted permission to another user’s public address. Assume that the contract will eventually be used by a DApp where users can grant permission and other users can check if they have permission for some entity. Use the setGrantAddress() to allow public addresses to have access to the msg.sender account. Use removeGrantee() to revoke the access privileges again from the msg.sender account. Use checkPermission() (input address in the msg.sender) from any account to check whether the access is provided to any other valid account. getGrantAddresses() to see all those accounts to which access has been granted. accessableAddresses() to see all those those accounts to which the msg.sender account has access to. Not the answer you're looking for? Browse other questions tagged solidity remix contract-deployment rinkeby or ask your own question.